Wesaam Al-Badry’s first and fondest memory of his father, Sattar, was visiting him in an Iraqi prison. Sattar had been imprisoned and tortured for being a pacifist who refused to fight in the Iran-Iraq war. There were at least 20 other prisoners in the same cell, Wesaam recalled where his father hugged him and held him in his lap. It was an unlikely setting for a tender encounter, but Wesaam and his family had learned to find comfort where they could. His mother raised five children in crushing poverty in Nasriyah, which they fled when the gulf war’s fighting approached in 1991. After years in refugee camps where food was scarce the family was granted refugee status in the United States and settled in a rundown apartment building next to railroad tracks and a plastics factory in Lincoln, Nebraska. The family was deeply grateful. 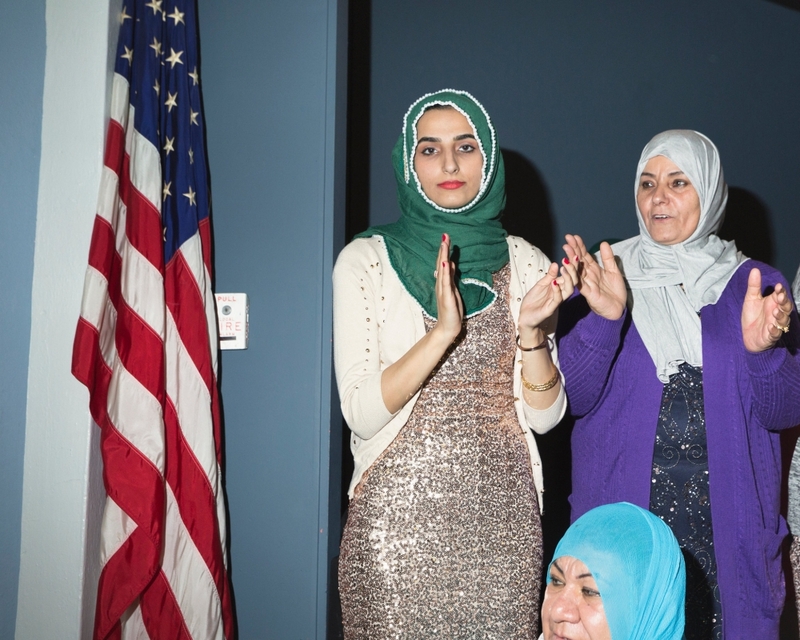 Twenty-three years later, Wesaam, now a photographer in graduate school, has documented his family’s refugee experience in Nebraska. He portrays them — in images and text — as he sees them, as beautiful and elegant. “Nobody’s family is perfect, but mine is perfect for me,” he explained. In Lincoln, the family, now including seven children, struggled to adjust. Within a week of their arrival, Wesaam, who was 11 and did not speak English, was so overwhelmed by the changes that he hyperventilated and was rushed to a hospital by neighbors. He returned home — after four hours — with an inhaler and his first McDonald’s meal in a bag. His father found work as a truck driver for a printing company, but separated from Aeda four years after they arrived. He was rarely in his family’s life afterward, Wesaam said. Aeda held the family together. They lived in subsidized housing and relied on food banks, while Wesaam, the eldest, worked summers starting at 14 in a pizza parlor. Wesaam felt like an outsider, so he hung out with other refugees from Bosnia, Serbia, Sudan and Somalia. Most could barely speak any English, but they enjoyed a quiet camaraderie. Still, he was bullied for being different, and started acting out, skipping school and getting into fights. He now sees this behavior as a result of post-traumatic stress from war and living in refugee camps. Most of his family members were also suffering — yet they never talked about what had happened to them. Each of his siblings was affected by their family’s experiences differently, he said. His sisters, Shams, 27, Zeinab, 26, and Shanon, 23, the three youngest, have gone to college, are living successful lives and are active in their communities, Wesaam said. But he and two of his brothers have had a rougher time. In the eight years after high school, Wesaam worked in a meat packing plant, a slaughterhouse, a metal stamping factory and in asbestos removal. He went to bars after work and for a while drank too much, too often, he said. His brother Hussam, 34, who works in a metal plating factory and has two young daughters, rarely talks about his experiences, Wesaam said, though he was deeply affected by them. Abbas, 29, spent his time partying, was imprisoned for selling cocaine and is now in drug rehab, which is part of a prison work-release program, Wesaam said. In 2008, Wesaam followed his longtime interest in photography by buying a digital camera and setting out to make a photo essay about his mother and her Iraqi women friends. It was published on several websites, including the Kansas City Star, and one photo was used in a United Nations refugee campaign. Wesaam’s wife, Maliha Zuberi, encouraged him to go to college at the San Francisco Art Institute, where he received a BFA in fine arts, and then to attend journalism school at Berkeley. Wesaam wants to show the resilience of people who have been marginalized. While his own family didn’t talk about their “pain or struggles,” he said, they persevered, and this project gave them another chance to open up.